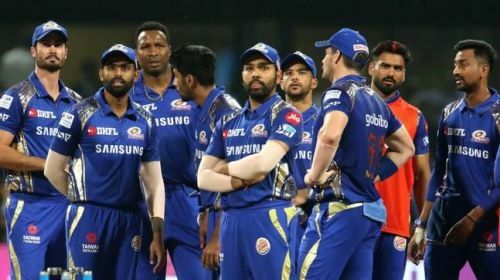 Mumbai Indians begin the 12th edition of IPL against Delhi Capitals at Wankhede Stadium, Mumbai on March 24, 2019. Mumbai then play Royal Challengers Bangalore at M.Chinnaswamy at Bengaluru on 28th March. The three-time IPL champions return to home on April 3rd to play against their arch rival before which they take on Kings XI Punjab at Mohali on 30th March. They get a two and three-day breaks before they play their next two matches against Sunrisers Hyderabad and Kings XI Punjab. 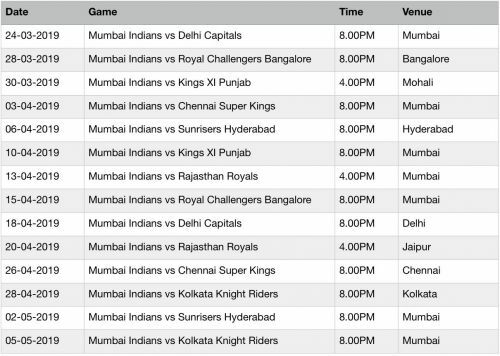 Mumbai Indians then play two consecutive matches at home against Rajasthan Royals and Royal Challengers Bangalore. They then play 4 consecutive games away games against Delhi, Rajasthan, Chennai and Kolkata on 18, 20, 26 and 28th April. Mumbai then takes on Sunrisers at home on May 2nd before completing their tour against Kolkata at the same venue on 5th May. Mumbai had a forgettable season last year as they failed to qualify for playoffs. They will look to bounce back this year and they look to be in the right path towards achieving their goal. Mumbai Indians retained their core set of players which includes players like Rohit Sharma, Hardik Pandya, Kieron Pollard, and Jasprit Bumrah. They bought 6 players in IPL Auction, which includes Yuvraj Singh who was bought for ₹1 crore. Mumbai focused mainly on youngsters this auction as they brought in players like Anmolpreet Singh, Pankaj Jaiswal and Rasikh Dar. Besides these buys, Mumbai brought in South African wicket-keeper Quinton de Kock from Royal Challengers Bangalore in transfer window, which was much lauded as a smart move from the team management. Rohit Sharma (c), Hardik Pandya, Jasprit Bumrah, Krunal Pandya, Ishan Kishan, Suryakumar Yadav, Mayank Markande, Rahul Chahar, Anukul Roy, Siddhesh Lad, Aditya Tare, Quinton de Kock, Evin Lewis, Kieron Pollard, Ben Cutting, Mitchell McClenaghan, Adam Milne, Jason Behrendorff, Quinton De Kock, Lasith Malinga, Yuvraj Singh, Anmolpreet Singh, Barinder Sran, Pankaj Jaiswal, Rasikh Salam.